Our towing service will transport your vehicle to our facility. Call us for payment and availability details. At Prairie Creek Auto Body we can repair your windshield and prevent the damage from spreading. If it needs to be replaced, we use only the finest materials in the industry and use only quality auto glass and materials with all our repairs no matter the make, model, or year of your vehicle. Prairie Creek Auto Body can remove minor dents and dings from your vehicle’s body panels without damaging the paint. This means the vehicle’s original paint warranty will stay intact. We do this by using a method called PDR- Paintless Dent Repair. We can use PDR to repair minor damage from the following: Hail, Dings, Body Creases, and more. The repair time is drastically reduced with this method, thus allowing a quick return of your car, truck, or SUV. At Prairie Creek Auto Body our collision repair services are state of the art. Providing excellent customer service and quality repairs is our number one goal. Our highly skilled technicians have years of experience and training. We go out of our way to clarify and simplify the repair process to our clients. We work for you and we negotiate with Insurance companies on your behalf. After being in the business for over 30 years we have working relationships with all the insurance companies, and we’ll make sure to get your vehicle back to “before collision” condition. 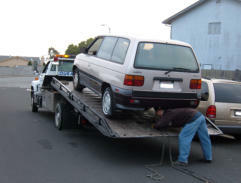 Towing Our towing service will transport your vehicle to our facility. Call us for payment and availability details. Auto Body Refinishing We deliver a beautiful coat of paint! 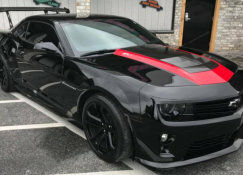 It doesn’t matter whether you want 3-stage special effects or just a simple flat black our skilled technicians are known throughout Northwest Arkansas for their auto painting. They know that the key to a successful paint job lies in the prep work. Even as good as they are, they know paint will hide nothing unless the surface is properly prepared prior to the start of spraying. Windshield Repair At Prairie Creek Auto Body we can repair your windshield and prevent the damage from spreading. If it needs to be replaced, we use only the finest materials in the industry and use only quality auto glass and materials with all our repairs no matter the make, model, or year of your vehicle. 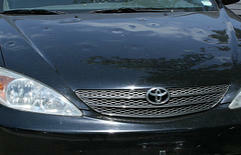 Auto Body Repair At Prairie Creek Auto Body our collision repair services are state of the art. Providing excellent customer service and quality repairs is our number one goal. Our highly skilled technicians have years of experience and training. We go out of our way to clarify and simplify the repair process to our clients. We work for you and we negotiate with Insurance companies on your behalf. After being in the business for over 30 years we have working relationships with all the insurance companies, and we’ll make sure to get your vehicle back to “before collision” condition.